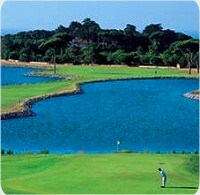 This was the first built Municipal golf course in Portugal. Located easily within the city, it's perfect for a quick escape from the downtown of Lisbon. This is a short and somewhat demanding course due to its reasonably undulating terrain and six artificial lakes. The course has three par-3 holes, whilst the others are all par-4. The course is capable of satisfying the needs of most types of golfers whether it is to learn the game or practice their shots. Also has a practice range for a quick shot session to relax and remove stress. Take the "Segunda Circular" from Benfica in the direction of the Airport. Exit the motorway at Olivais Sul. Some 20 metres prior to reaching the "Retunda do Relógio" turn right into the Avenida Gago Coutinho. 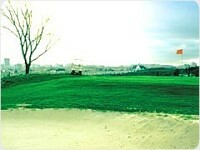 The course is in this Avenida on the right hand side.